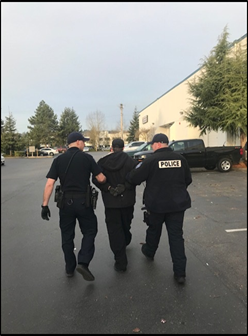 Kent Police made an arrest first thing Wednesday morning (Feb. 21) after receiving multiple tips identifying the suspect involved in Tuesday’s early morning bikini barista stand sexual assault (read our previous coverage, which includes security cam video, here). Kent Patrol and detectives responded to his workplace, located in the 6800 block of 190th Street in Kent (map below). The suspect has been identified as a 33-year-old Kent resident with an extensive criminal history. Investigators have not released his name as he has not yet been formally charged. You guys can be awesome! Great job. Let’s hope you don’t have to keep searching.